My wife and I for the last 8 years, at the tugging on my heart by God, have been running and operating a wood ministry. We cut, split and deliver firewood to poor families or those in need or have medical issues etc that do not allow them to get firewood on their own. The firewood is provided to these families free of charge. On average we do 65 to 110 cords of firewood a year, that's 130 to 220 full size pick up loads. The work is done mostly by myself and my wife. We do have a neighbor who helps us about 15 to 20 hours a week. Two years ago I did a GoFundMe to purchase an Eastonmade professional wood splitter. The GoFundMe went better than I had hoped and was able to purchase the splitter thanks to GENEROUS and giving people who donated their hard earned monies. Now we have need for a wood conveyor like the one shown in the picture. This wood ministry takes A LOT of work. 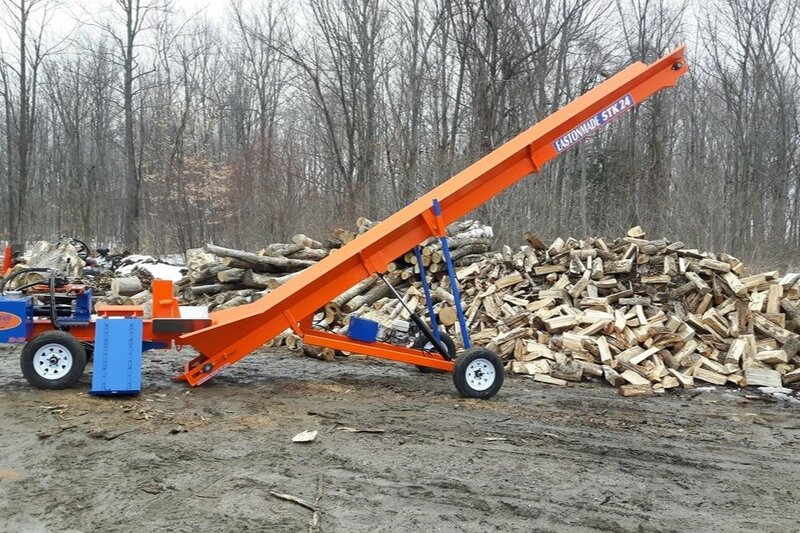 The new wood splitter has helped TREMENDOUSLY in the processing of the firewood, but the loading and moving the wood from where it is cut to where we stack it are a very tedious jobs and the wood conveyor would make these jobs a WHOLE lot easier and more efficient. We have purchased an old hay elevator which works really well when it works. This elevator was built to handle bales of hay, not wood and as such it takes a pounding from the wood and is always in need of repair, adjustment or modification to keep it running. These wood conveyors like the Eastonmade are built specifically for wood so they can take the pounding and the heavy load of wood as they are built from rugged steel and are equipped with the necessary hydraulics and engines to power the conveyor. I wish we had the money ourselves just to outright pay for the wood conveyor, but we don't. The wood ministry is supported by our church via the gas, oil, purchasing of the logs, etc., but it just doesn't have the funds for purchasing the wood conveyor. The wood ministry takes care of NUMEROUS family's heating needs for the winter and the families are scattered over a LARGE area. We service families in a 5 county area as far as 50 or more miles from our home where we base the wood ministry from. I know I have used GoFundMe in the past as I've stated earlier and honestly I hesitate to do it again because I hate to go to the well once too often as I don't like to ask for donations from people, but I have been encouraged to do this by friends and family and quite frankly I believe God and so I do. Thank you so much for reading this story and your consideration in donating and if you do donate I can only offer my gratefulness and appreciation in you partnering with us to help bring heat and comfort to those who struggle. Thank you.